One of the low points in the history of Spiritualism involves the career of a British medium named Helen Duncan. Some continue to maintain to this day that she was a “martyr” to the movement but most see her as one of the frauds that helped to give Spiritualism a bad name. Helen Duncan was born in Scotland in 1898, married at the age of 20 and began to develop psychic talents that were much in demand by the 1930s and 1940s. She traveled the country during this period and held séances in private homes and Spiritualist churches. She convinced thousands of people that the dead could return in various forms but most often, through ectoplasm, that slimy, white substance said to be manifested by spirits. In reality, Helen’s “ectoplasm” was found to be nothing more than a mixture of paper, cloth, egg white and surgical gauze. She was able to regurgitate the substances on demand. Any lingering doubts about this were dispelled by the medium’s husband, who gave an interview late in life that admitted he had seen his wife swallowing various things before her séances. In addition to her ectoplasmic forms, Duncan also worked with spirit guides. One in particular was a child named “Peggy”, who played an important role during the séances. However, in 1933, at a sitting in Edinburgh, a policewoman grabbed at “Peggy” as she passed by her and discovered that the ghostly girl was actually a torn piece of white underwear! Duncan was arrested, charged with fraud and fined ten pounds. Less than two months later though, she was back at work. Undaunted by her exposure, Duncan proceeded to give a series of test sittings for the National Laboratory of Psychical Research, under the direction of its founder, Harry Price (who we will read much more about later in the book). Price had already exposed a number of fraudulent mediums but was not a debunker of what he considered to be genuine. He was of the opinion that some mediums, including D.D. Home and Eusapia Palladino had occasionally managed to produce genuine mental and physical phenomena. Price was not forced to classify Helen Duncan as one of these exceptional cases, though. 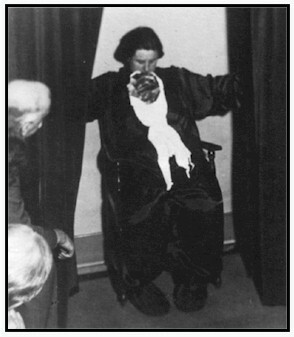 Photographs taken during her sessions revealed that the “ectoplasm” she produced was a length of cheesecloth whose bound edges, texture and creases were clearly visible. Duncan was investigated by Harry Price at his laboratory and he concluded that she produced her effects by swallowing and then regurgitating materials that she tried to pass off as "ectoplasm". Needless to say, he was not impressed. None of her exposures made any difference to Helen’s public. Outside of the laboratories, her fame continued to grow and sitters continued to insist that they recognized departed friends and loved ones in the ectoplasmic faces that she materialized. During World War II, her mediumistic powers were much in demand by relatives of those who had died in the service. She held a number of séances in Portsmouth, Hampshire, the home port of the Royal Navy, and one of these, held on January 19, 1944, was raided by the police. A plainclothes policeman who was present blew a whistle to give a signal and other officers burst in. A grab was made for the ectoplasm issuing from the medium and the séance was abruptly brought to an end. Although nothing incriminating was found, Duncan, along with three others who arranged the séance, Ernest and Elizabeth Homer and Francis Brown, was taken to the Portsmouth magistrate’s court and arraigned on charges of conspiracy. At the preliminary hearing, the court was told how Lieutenant R.H. Worth of the Royal Navy had attended one of Duncan’s séances and suspected fraud. He bought two tickets for 25 shillings each for the night of January 19 and took a policeman named Cross with him. Cross grabbed the “ectoplasm” that floated past him (which he believed was a piece of white sheet, although no sheet was found when the séance was raided) but he was unable to hang onto it. After the hearing, bail was refused and as a result, Duncan was remanded to Holloway Prison in London for four days before the case was resumed in Portsmouth. Duncan is seen materializing her spirit guide, "Peggy", which appears to show that "Peggy" is made from papier-mâché and cheesecloth, with a face attached to it. Needless to say, the Witchcraft Act of 1735 was hopelessly outdated, regardless of the guilt or innocence of the defendant. Spiritualists were dismayed by the use of the act to bring about prosecution of the famous medium. They believed that she would be found guilty whether or not her powers were genuine. They were angry because they believed that Duncan was an authentic medium and was being persecuted for her genuine gifts. The prosecution, however, clearly believed that Duncan was a fraud, which was why they charged her with larceny. The use of the Witchcraft Act remains a bit of an enigma but it certainly gained the trial a lot of publicity. The trial took place in later winter of 1944 and lasted for seven days. Numerous witnesses testified to events they had seen at Duncan’s séances. One of them, Kathleen McNeill, claimed that she had attended a séance where her sister had appeared. This sister had died just a few hours before, after an operation, and news of her death could not have been known to Duncan at the time. At another séance, McNeill claimed that her father strode out of the spirit cabinet, looking just as he had when he was alive. Two journalists, H. Swaffer and J.W. Herries, were also called by the defense. The flamboyant Swaffer told the court that not only was ectoplasm real; it could not have been regurgitated by the medium. That was ridiculous, he stated. Herries claimed that he had seen Sir Arthur Conan Doyle materialize at one of Duncan’s séances. He noted the author’s rounded features and mustache and recognized his voice, he said. One has to think that Sir Arthur, despite his great belief in the legitimacy of Spiritualism, would have been embarrassed to appear at such a shoddy affair as Duncan was offering. The prosecution had to make little effort to convince the jury that Duncan was a fraud. 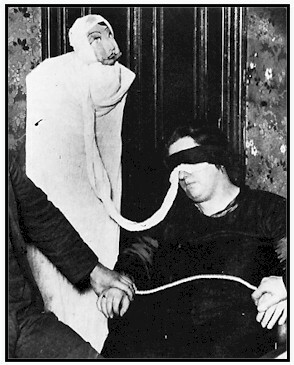 They made liberal use of photographs taken at Duncan’s séances showing blatantly fake “ectoplasm” emerging from the medium’s mouth and nose. One particular favorite was a photo of the spirit child “Peggy” slithering out of Duncan’s nostrils. In the photo, the “ectoplasm” boasted a face that was obviously that of a child’s doll! Prosecuting counsel John Maude produced a long piece of butter muslin and referred to the report by Harry Price, who stated that he believed Duncan swallowed the material and then regurgitated it. The jury seemed convinced that she was a fraud. At the start of the trial, the defense offered the jury an actual demonstration of Duncan’s mediumship but the judge declined the offer and stated that perhaps Mrs. Duncan should testify as a witness instead. The defense replied, however, that Helen could not testify, as she was in a trance during the séances and unable to discuss what transpired. On the final day, the judge changed his mind and asked the jury if they wanted to see Helen Duncan perform. After a couple of minutes of discussion, they declined the offer. It took just 25 minutes for the jury to return their verdict: they found the four defendants guilty of conspiracy to disregard the Witchcraft Act. They were discharged from giving verdicts on the other counts. The judge deferred pronouncing sentence until after the weekend but when he court did reconvene, he stated that the verdict had not been concerned with whether “genuine manifestations of the kind are possible… this court has nothing to do with such abstract questions. The jury has found this to be a case of plain dishonesty.” He sentenced Duncan to serve nine months in prison and the medium was led away moaning and crying. Of the other defendants, Mrs. Brown was given four months (she had previous convictions for larceny and shop-lifting) and the Homers were each given a small fine and placed on probation for the next two years. Helen Duncan served her sentence at Holloway Prison. The Spiritualist movement, shocked by the verdict, called for a change in the law to prevent such prosecutions in the future. They felt that Duncan had been unfairly treated but they did cool their enthusiasm for her after the trial. Public perception was that a fraud had been exposed and officials in the movement decided to put some distance between themselves and the medium. When she was released from prison on September 22, 1944, Duncan announced that she was retiring from séances, but thanks to the large number of faithful followers that she still had, she soon changed her mind. She continued to offer private séances for years afterward. In 1951, the Witchcraft Act of 1735 was repealed and replaced with the Fraudulent Mediums Act. Helen Duncan’s trial had certainly prompted this changed in the law but hopes from the Spiritualists that they would no longer be subjected to police harassment were short-lived. In November 1956, police raided a séance taking place in Nottingham. They grabbed the medium, searched her and photographed her. They shouted that they were looking for beards, a mask and a shroud but found nothing. The medium conducting the séance was Helen Duncan. Duncan almost immediately became ill after the raid, possibly from shock, and died five weeks later. The doctors listed the cause of death as diabetes and heart failure, but a certain segment of the Spiritualist worth thought otherwise. Some complained of “police brutality” and even “murder”, mostly because the medium had been interrupted during a trance, which all agreed could be extremely dangerous. Even today, Helen Duncan is still seen by some as a “martyr” to the cause of Spiritualism, a victim of the world’s intolerance. To most though, she is seen as another fraudulent medium that, unlike most in the same circumstances, actually got her day in court. Those who point to the egg white and muslin “ectoplasm”, the phony photographs and the torn underwear “spirit guides” would say that in this case, justice prevailed.